648 pages | 4 Color Illus. | 78 B/W Illus. Infants and children spend one- to two-thirds of their life asleep. Despite this, very little attention has been paid to understanding both normal sleep and sleep-related abnormalities during child development. 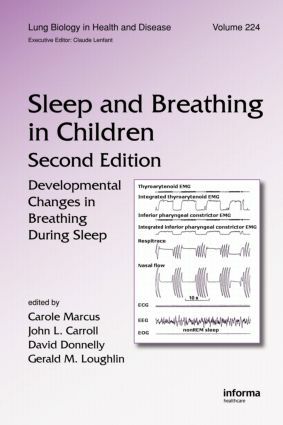 This volume is devoted to breathing during sleep, its changes with development (from the fetus onwards), and the pathophysiology of sleep-related breathing disorders. Introduction, Foreword, Preface, Breathing and Sleep States in the Fetus and at Birth. Laryngeal Function and Neonatal Respiration. Postnatal Development of Carotid Chemoreceptor Function. Maturation and Plasticity of Central Components in Cardiovascular and Respiratory Control. Maturation of Breathing During Sleep. Interaction Between Upper Airway Muscles and Structures During Sleep. Craniofacial Development and the Airway During Sleep. Breathing and Sleep in Preterm Infants. Apnea During Infancy. Apparent Life-Threatening Events: Pathogenesis and Management. Pathophysiology of Sudden Infant Death Syndrome. Sudden Infant Deaths: Risk Factors, Contributory Factors, and Causal Factors. Sudden Infant Death Syndrome: Genetic Studies in Cardiorespiratory and Autonomic Regulation. Effects of Intermittent Hypoxia on the Developing Organism. Influence of Prenatal Nicotine Exposure on Development of Neurotransmission in Central Respiratory Neurons. Central Hypoventilation Syndromes. Genetic Basis for Congenital Central Hypoventilation Syndrome. Epidemiology of Pediatric Obstructive Sleep Apnea. Pathophysiology of Childhood OSAS: Structural Factors. Pathophysiology of Childhood OSAS: Neuromotor Factors. Cognitive and Behavioral Consequences of Childhood OSAS. Inflammatory Association with Childhood Obstructive Sleep Apnea Syndrome. Metabolic Aspects of Sleep Apnea in Children. Cardiovascular Complications of Childhood OSAS. Acoustic Reflectance. Pediatric Obstructive Sleep Apnea Syndrome.